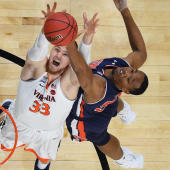 ELON, N.C. (AP) Nathan Knight scored a career-high 35 points to go with 13 rebounds and four blocked shots and William & Mary defeated Elon 84-74 on Saturday night. Knight made 13 of 20 from the field and 9 of 11 foul shots. Matt Milon added 19 points and Justin Pierce scored 18 with 12 boards for the Tribe (10-16, 6-8 Colonial Athletic Association). Tyler Seibring had 17 points and 14 rebounds for the Phoenix (8-19, 4-10). Steven Santa Ana scored 15 points, Nathan Priddy 14 and Sheldon Eberhardt 13. Elon led 38-34 at halftime but William & Mary took the lead early in the second half. The Tribe built their lead to 79-72 after Knight scored on consecutive possessions near the two-minute mark. The Tribe closed out the win by making 5 of 6 free throws. William & Mary had 17 assists on 29 made baskets, 10 steals and only nine turnovers.